Every time a Genevieve Graham title comes through, I’m on it. I really like the MacDonnells series, and I’m glad I picked up the first title, Under the Same Sky as well as the second title, Sound of the Heart. I’m excited that the series keeps getting better for me, with subsequent titles. 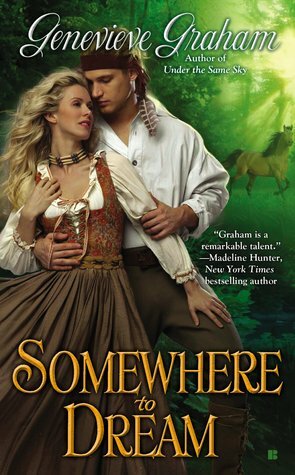 While Ms. Graham appears to be a kindred spirit, bringing the Scots as well as Native Americans into her writing (personal areas of interest), she does so respectfully and with accuracy. What I adored about this book was the way the reader felt as though they were in the middle of a Cherokee village in the early days of America. The social and political unrest were tangible in the story. I adored the way the first two titles in the series were tied in to the story. If you haven’t read the first two titles, it’s OK. Ms. Graham explains what you need to know. It did give me that little sense of déjà vu when I read certain parts, especially when we met Maggie – the heroine’s sister – again. I was OK with the way we were introduced to Jesse. At first, it bothered me a little bit. Then, as I read through how Jesse wasn’t instantly accepted, it was more believable than if he’d been automatically made a member of the tribe with all the benefits thereof. Even though they believed he was part of their tribe, the Cherokee waited until Jesse believed that he belonged. It seemed as though the story were about Jesse and his acceptance to the Cherokee tribe. But it was about so much more than that. Adelaide learning about herself, her dreams/visions. Figuring out where SHE belonged. Learning to trust her instincts. I thought the focus was on Adelaide, but it was split between the two, overall. Adelaide started off as a mouse. Jesse flat-out called her that. Her Cherokee name was Shadow Girl. I was pleased that she lost that by the end of the book. I did think Adelaide was a little flat as a character until she started to stand up and be her own woman. Which is probably what endeared her to me as a character. Watching her develop as a character was one of the things that drew me through the story. Seeing the facets develop and become prominent was exciting! Waiting for the relationship with Jesse to develop was an exercise in patience. While everything was based on Adelaide’s readiness, I think that the pacing for their romance was a little slower than I like. Over-all, I really liked Somewhere to Dream. The setting in the Cherokee settlement, as well as the way the characters both battled their own inner demons made me love the characters and root for them to be together. In the end, love conquered all. I can’t wait to read more from the MacDonnell series by Ms. Graham. The Cherokee call her Shadow Girl. A white woman adopted by Indians, Adelaide is haunted by the dark dreams she hides—of her murdered family, of the men she fears, and most of all, of the ones that foretell the future. After her visions cause her to make a terrible mistake, she renounces her power and buries her dreams deep in her soul. I have never heard of this author but it is cool the mix of Scot and Native American. This will sound really corney but when I first started reading historicals Native American were my number one then I moved on but with my new love Sleepy Hollow I am starting to want to read stuff set in the US past again. Cool review.